Photo: Thomas A. Hendricks House, ca. 1891, Route 135 and Bellsville Road, Van Buren Township, Brown County, IN. Listed on the National Register of Historic Places in 1984. Photographed by User:Nyttend (own work), 2010 [cc0-by-1.0 (creativecommons.org/publicdomain/zero/1.0/deed.en], via Wikimedia Commons, accessed May, 2015. The history of Brown County is the history of a proud and free people. In the treaty of Fort Wayne, the United States acquired land from the Native Americans in 1809. In the 1818 Treaty of St. Mary's more territory was added. From these-two treaties came the land that is now Brown County. A government survey was completed in 1820. That same year, William Elkins, the first pioneer, built a Jog cabin and cleared land in what became Johnson Township. By 1830 an estimated 150 settlers had arrived. By 1840 the census reported 2,354 people. In 1835 a petition was presented to the Indiana legislature requesting a new county. Up until that time what is now Brown County was a part of Monroe, Bartholomew and Jackson Counties. On February 4, 1836, the legislature passed a bill providing for the formation of a county named Brown, in honor of Major General Jacob Brown, a hero of the War of 1812. The county was 16 miles by 20 miles, totaling 320 square miles. In 1890, 10,308 people lived in Brown County subsisting primarily by agriculture and logging. During the next 40 years, the county population was reduced by half. Poor conservation practices and thin soils left many ridges eroded and no longer able to support agriculture. Many residents left for the flatter, more fertile land to the north. Not until 50 years later did the population return to and pass the 1890 figure. In the 1930's, federal conservation programs were developed and Brown County slowly recovered from its disastrously eroded condition. Land acquisition for state and national forests and Brown County State Park allowed much of the County to return to its pristine beauty. 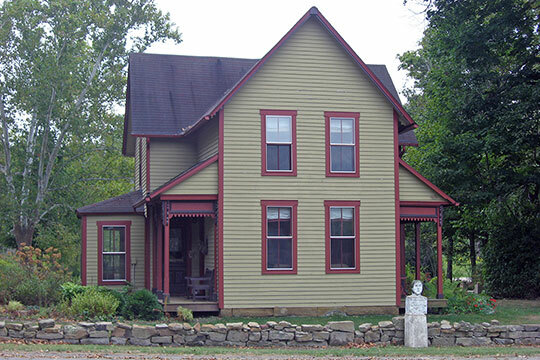 Since the early 1800's, people have been coming to Brown County to live. Many early settlers came from the mountains and hills of Kentucky, Tennessee, Virginia, North Carolina and South Carolina. While we can never know their individual reasons for coming, they came as pioneers, and much of that pioneer spirit remains in those who live in Brown County today. Brown County Area Plan Commission, Comprehensive Plan for Brown County, Indiana, 2000, revised, www.atterburyjlus.com, accessed May, 2015.